[S807] Find A Grave, online http://www.findagrave.com, memorial 119181327. [S807] Find A Grave, online http://www.findagrave.com, memorial #49369170. [S807] Find A Grave, online http://www.findagrave.com, memorial #116893218. [S807] Find A Grave, online http://www.findagrave.com, memorial #115705254. [S807] Find A Grave, online http://www.findagrave.com, Find A Grave, database and images (https://www.findagrave.com : accessed 25 January 2018), memorial page for Herbert Holcomb (1876–1932), Find A Grave Memorial no. 149238793, citing Maple Grove Cemetery, North Branch, Lapeer County, Michigan, USA ; Maintained by Paws ? (contributor 47049802) . Sarah J. Abson married Carlton Heath Holcombe, son of John Hornsby Holcombe and Abigail Cummings, on 30 December 1875. Sarah J. Abson died on 6 March 1897. William L. and Catherine M. were enumerated in the 1930 Detroit, Wayne Co., MI, federal census. He was a laborer in an auto factory age 31, she was 29. Children in the household were Gordon B. 9, Herbert A. 4, Merton K. 2 years 1 month, and Duane G. 3 months. Weston is not mentioned elsewhere. William Holcomb, 44, died very suddenly in his home in Detroit Tuesday morning, April 20, of a heart attack. Funeral services were held Thursday morning in Detroit and the remains were brought to Novesta Cemetery for burial. Services were held at 1:00 p.m. Eastern War Time. Mr. Holcomb was born in Lapeer County and was married to Miss Catherine Gillies. They formerly lived in Kingston Township, going to Detroit 19 years ago. He is survived by his widow, five sons, Gordon, H. A., Merton, Duane and Billie, all at home. A daughter, Vivian, died in infancy. He also leaves two brothers, Kenneth Holcomb, Detroit, and Hune Holcomb with the U. S. Navy; two sisters, Mrs. Elizabeth Smith of Imlay City and Mrs. Nora Walker of Detroit. Mr. Holcomb was a member of Decker Lodge, F. & A. M., and services at the grave were conducted by that organization. Mr. Holcomb was a nephew of Levi Holcomb of Cass City and a cousin of Bruce Holcomb. [S807] Find A Grave, online http://www.findagrave.com, memorial # 120606054. Mary Loomis married Lafayette A. Norton in 1871. Mary Loomis married Carlton Heath Holcombe, son of John Hornsby Holcombe and Abigail Cummings, in February 1901. Mary Loomis died on 25 August 1931. Jessie May Newman was born on 19 January 1879 at Lyon Co., KS. She married Braton Harlow Pritchard, son of Horatio Pritchard and Frances Marian Norton. Jessie May Newman died on 15 September 1961 at Eureka, Greenwood Co., KS, at age 82. Beulah Alice Mansell was born on 4 July 1921 at Toronto, Woodson Co., KS. She married Eugene John Pritchard, son of Braton Harlow Pritchard and Jessie May Newman. Beulah Alice Mansell died on 1 December 1999 at North Hollywood, Los Angeles Co., CA, at age 78. Janice Kay Wilson was born on 11 November 1944 at Laramie, WY. She married Jerry Joe Pritchard, son of Eugene John Pritchard and Beulah Alice Mansell. Janice Kay Wilson died on 15 January 2016 at Bellingham, Whatcom Co., WA, at age 71. [S807] Find A Grave, online http://www.findagrave.com, memorial # 120155373. [S807] Find A Grave, online http://www.findagrave.com, Find A Grave, database and images (https://www.findagrave.com : accessed 25 January 2018), memorial page for Kenneth Lloyd Holcomb (6 Mar 1910–10 Jun 1957), Find A Grave Memorial no. 120155373, citing Maple Grove Cemetery, North Branch, Lapeer County, Michigan, USA ; Maintained by dd mathews (contributor 47284740) . [S807] Find A Grave, online http://www.findagrave.com, Find A Grave, database and images (https://www.findagrave.com : accessed 25 January 2018), memorial page for Hume Ernest Holcomb (30 Nov 1913–17 Dec 1984), Find A Grave Memorial no. 3818659, citing Riverside National Cemetery, Riverside, Riverside County, California, USA ; Maintained by US Veterans Affairs Office (contributor 5) . Amy Pritchard was born on 23 August 1965. She was the daughter of Jerry Joe Pritchard and Janice Kay Wilson. Amy Pritchard died on 19 December 2012 at TX at age 47. Janice K. Wilson was born on 11 November 1944 at Laramie, WY. She married Michael D. Pritchard, son of Eugene John Pritchard and Beulah Alice Mansell. Janice K. Wilson died on 15 January 2016 at Bellingham, Whatcom Co., WA, at age 71. [S336] Ancestry.com, Ancestry.com. 1870 United States Federal Census [database on-line]. Provo, UT, USA: Ancestry.com Operations, Inc., 2009. Images reproduced by FamilySearch. Year: 1870; Census Place: District 3, Wayne, Tennessee; Roll: M593_1569; Page: 423B; Family History Library Film: 553068. Mollie Thomason was born on 23 September 1863 at Little 'Possum Creek, Flatwoods, northern Wayne Co., TN. She was the daughter of Frances Marion Thomason and Margaret A. Smith. [S807] Find A Grave, online http://www.findagrave.com, memorial # 115082432. Ruth Day was born at Spencertown, Columbia Co., NY. She married Gideon Curtis, son of Gideon Curtis and Elizabeth Mills, circa 1808 at Norfolk, Litchfield Co., CT. Ruth Day died on 26 August 1855 at Owego, Tioga Co., NY. Caroline Abigail Curtiss was born on 20 August 1808 at NY. She was the daughter of Gideon Curtis and Ruth Day. Caroline Abigail Curtiss married Isaac Otis on 25 January 1827 at Homer, Cortland Co., NY. Caroline Abigail Curtiss died on 12 March 1883 at Kalamazoo Twp., Kalamazoo Co., MI, at age 74. Herbert Lawrence Aiken was born on 11 September 1897 at MI.1 He married Emma Holcombe, daughter of Chester J. Holcombe and Harriet May Sargent, on 2 February 1924 at Lapeer, Lapeer Co., MI.1 Herbert Lawrence Aiken died in December 1966 at East China, St. Clair Co., MI, at age 69. Amelia Josephine Harres was born on 1 February 1837 at Philadelphia, Philadelphia Co., PA. She married Alfred Gideon Otis, son of Isaac Otis and Caroline Abigail Curtiss, on 22 April 1862 at Philadelphia, Philadelphia Co., PA. Amelia Josephine Harres died on 2 February 1912 at Atchison, Atchison Co., KS, at age 75. Amelia Otis was born in March 1869 at KS. She was the daughter of Alfred Gideon Otis and Amelia Josephine Harres. Amelia Otis married Samuel Stanton Earhart on 16 October 1895 at Trinity Episcoal Church, Atchison, Atchison Co., KS. Amelia Otis died in 1962 at Medford, Middlesex Co., MA. 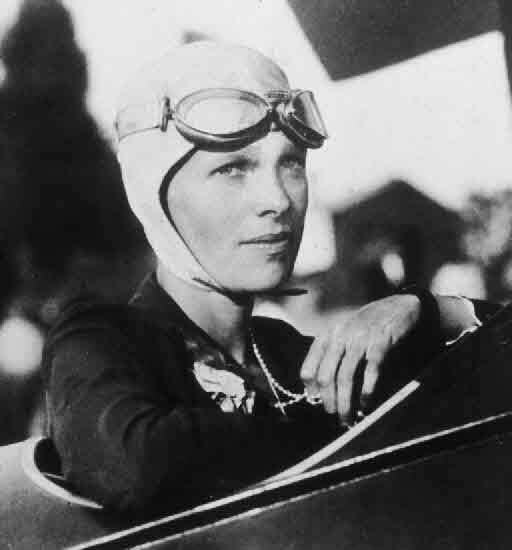 Amelia Mary Earhart was born on 24 July 1897 at Atchison, Atchison Co., KS. She was the daughter of Samuel Stanton Earhart and Amelia Otis. Amelia Mary Earhart died circa 2 July 1937 at Nikumaroro Island, Phoenix Islands, Republic of Kiribati. Researcher Richard Jantz wrote that what he found "strongly supports the conclusion that the Nikumaroro bones belonged to Amelia Earhart." The details were published in a research article authored by Jantz, professor emeritus of anthropology at the University of Tennessee, in the journal Forensic Anthropology 7 March 2018.